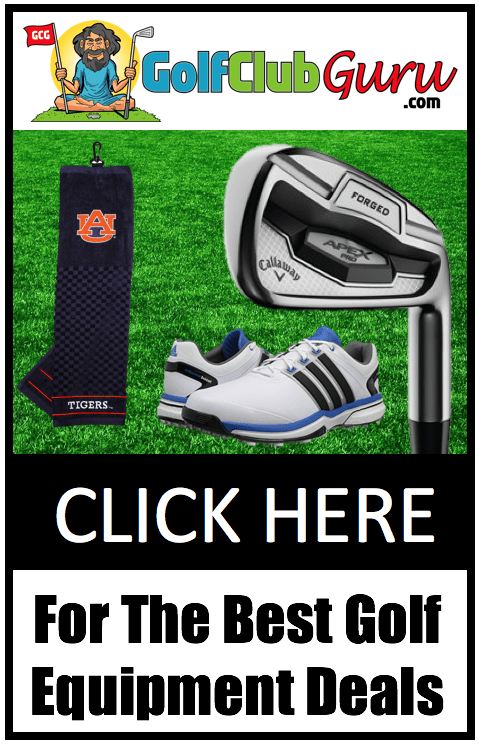 We all wish we could afford the newest releases shown in the Best Irons for Seniors, but the truth is that most golfers are not willing to spend $500 dollars on a set of irons that will improve their scores by a shot or two. 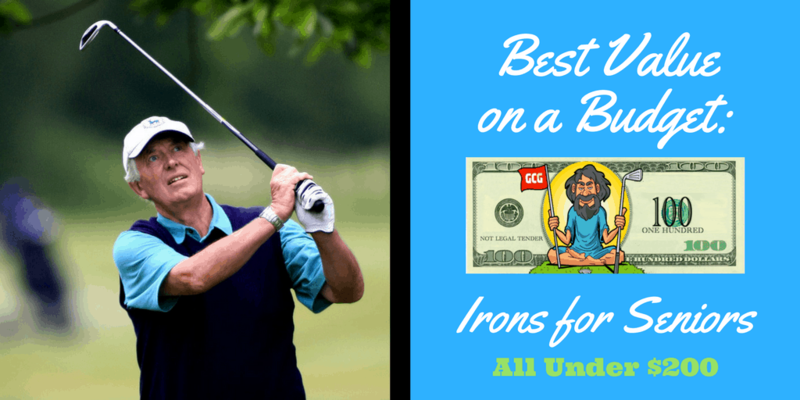 For all the frugal golfers out there, who want a solid set of irons on a good budget, I made a list of the top 5 best iron sets for the money that seniors can buy. All links and pictures that you click on will take you to the respective iron sets available for sale on eBay! 1) They might have been released many years ago, as these clubs range from being introduced in 2011 to 2014. Each year, as golf club manufacturers release new products, their old products fall in value slightly. 2) They were so mass produced that sellers kept dropping their prices to keep up with the competition. Let’s face it. If you have been playing golf for many many years, you don’t swing as fast as you used to. Lighter graphite shafts will let you swing faster, resulting in higher, longer golf shots. 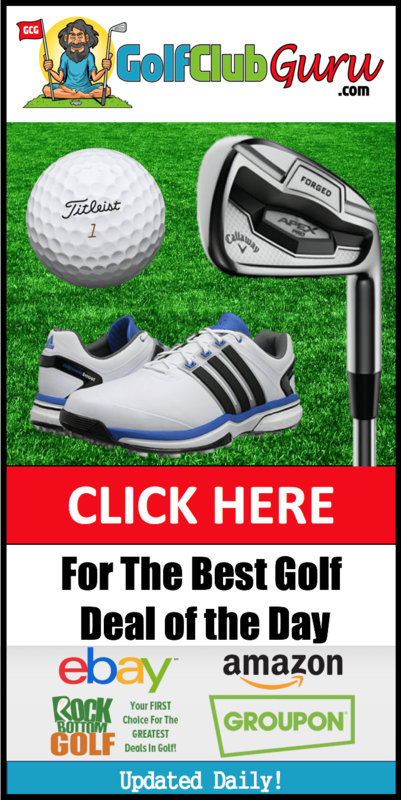 If you are new to golf, first of all look into potentially buying one of the best full sets of golf clubs for seniors for an even lower price than a combination of the “best on a budget” recommendations for drivers, woods, irons, wedges, and putters. Second of all, your distance potential is much less compared to when you were stronger and more flexible, so graphite shafts will typically be the way to go for you to play your best golf. Combo sets are absolutely perfect for senior golfers, as hitting long irons high and stopping them softly can be tough. I am a huge proponent of all senior golfers having at least 2 hybrids in their bags, and potentially more if you struggle with long irons and would like to substitute another more forgiving, high launching hybrid. 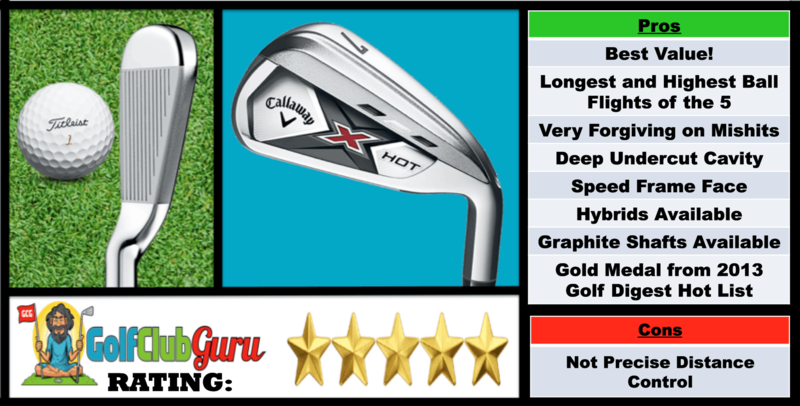 Without further ado, the number one iron set for seniors on a budget is the 2013 Callaway X Hot Irons. As a senior, the length and heights that you can hit the ball will surprise you. They are extremely forgiving, as you can see from the large topline and sole of the clubs. It’s honesty hard to hit anything but straight, so if you are looking for clubs that let you work the ball left and right, these aren’t the ones for you. The look at address is phenomenal, as the contrasting light and dark silver or grey make it extremely easy to align to your target. When I demoed these clubs, I had a little trouble with distance control, typically involving me hitting shots way longer than I thought I could. If I wasn’t so personally in favor of thin toplines, I would be gaming these irons without a doubt. As you can see from the pictures below, you can pick up a set of X Hot irons in great condition for $200. If you find one a little over $200 though, that would still be an incredible deal for the value that you are going to get in return. Although I couldn’t find a combo iron/hybrid set selling for $200 or less, there was one with 3 hybrids selling for $280, which is still an incredible deal for these clubs. The X Hot hybrids, which are available in 3H to 6H, are very easy to hit and launch the ball extremely high. If you are looking to make your own combo set by buying the hybrids separately, try to pick one up in good condition for about $50 or less. Deep Undercut Cavity: The Undercut Cavity acts similarly to TaylorMade’s Speed Pocket, as they both have a trampoline like affect on the ball, therefore increasing ball speeds and overall distance. Speed Frame Face: Ball speeds are optimized across the entire thin face of these irons, even on shots now hit perfectly on the center of the face. This is the same technology that they use on their drivers. Precision Center of Gravity Placement: The center of gravity on these irons is very low, allowing for stronger lofts that result in high, long iron shots. Feel Management Technology: Callaway says this technology fine tunes sounds and provides more feel and playability. However, I personally think that there is a big give and take when it comes to playability and distance, and these irons definitely lean towards distance. TL/DR: The Callaway X Hot Irons are perfect for someone that wants to hit longer, higher irons shots. 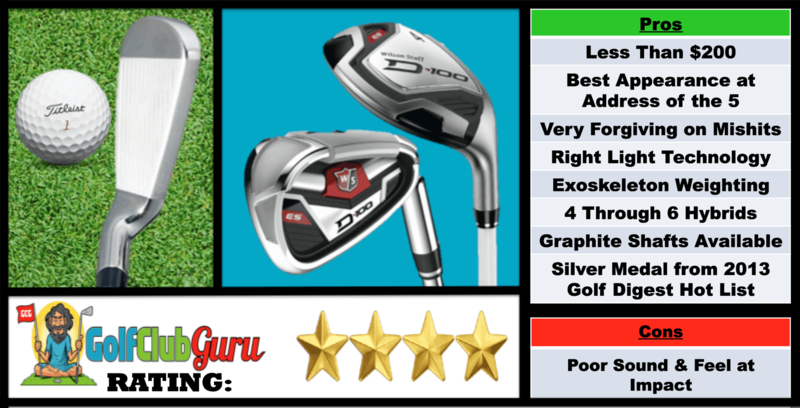 Also, if you already have a hybrid/hybrids that you really like and don’t want to replace, these are the perfect set of budget irons for you, as the combo sets are a little less common. Adams Golf is going to be very common in my “Best on a Budget” series. They make very high quality clubs for ridiculously low prices. If it weren’t for the Callaway X Hot clubs blowing me away with height, length, and forgiveness, this would be #1 on the list. Putting this combo set apart from any other, they are progressively sized, meaning the club heads get slightly bigger from Wedges to 4 Hybrid. This is great for seniors, as the change from irons to hybrids can often be difficult. These small changes between clubs make the switch from irons to hybrids very small. Also, there are some variations in the set that you can look out for if you would like (such as getting forged irons from 8-GW for feel or maybe V3-R Hybrid irons for even more forgiveness). The only downside of these clubs could be that some golfers dislike or maybe are not used to the black finish on the irons. Other than that, you can now go wrong with these clubs at the prices that they sell at. Combo sets in good condition sell for $200 and under pretty often. However, at that price I would urge you to buy some in like new condition for a little over $200 and get the most use out of them that you can. 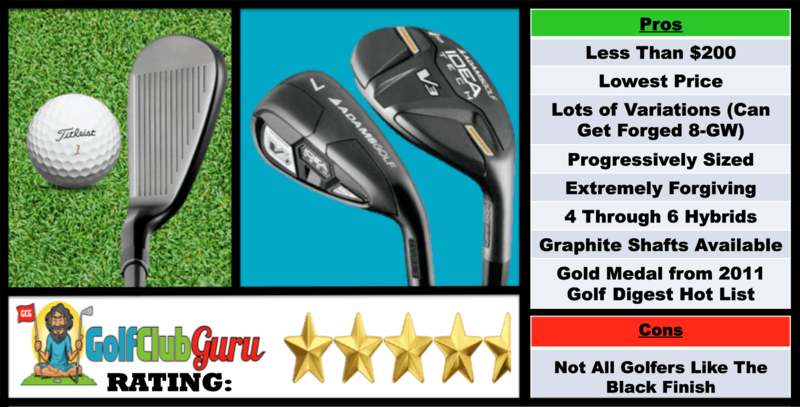 TL/DR: Adams Idea Tech V3 Combo Set is perfect for seniors not wanting to spend much money on clubs. They are the lowest price of the 5 by a decent margin. I love their progressive design, which makes changes between clubs much less dramatic. The Baffler XL Combo Set is by far the easiest set to hit that Cobra has ever made. 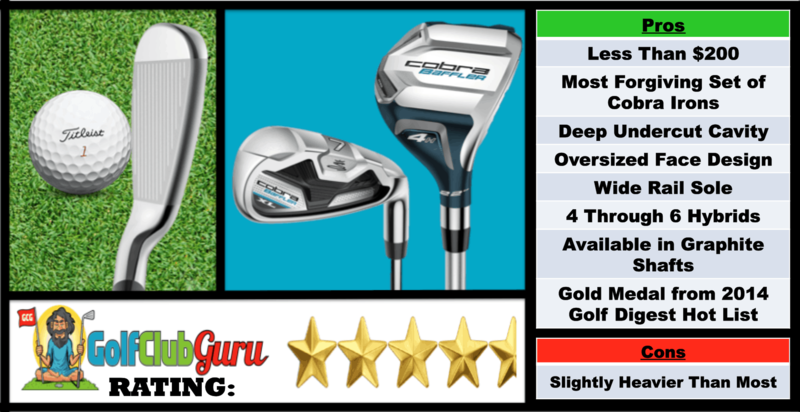 Cobra has made great strides in their reputation in the last few years, with many iron sets getting rave reviews from testers. The Baffler XL set is definitely one of them, as most high handicappers and seniors golfers in general love how forgiving they are and how solid they feel. Although they are slightly heavier than most game improvement clubs and therefore slightly shorter typically, you could say they make up for it with consistency and control. After all, it’s easier to be consistent with a heavier club head than with a light clubhead. Along with the other combo sets in this article, the Cobra Baffler XL Combo set can be bought for less than $200 if you wait for a good deal (typically an auction, not a buy it now). Nearing the $150 mark, this set of irons is perfect for golfers on a budget, as the difference between these and a $500 set of irons is minuscule. Some of the prominent features of the Cobra Baffler XL irons are their deep undercut cavity (same as Callaway’s) for ball speeds, oversized face design for forgiveness, and wide rail sole for improved club to turf interaction. TL/DR: These Cobra Baffler XL irons are perfect for golfers looking for more consistency and forgiveness, as opposed to those strongly searching for the longest irons around. Wilson hasn’t made much noise in golf for decades, but they have released a few sets that got rave reviews from golfers, with the D100 irons being one of them. This set is Wilson’s most forgiving set, and the addition of the hybrids make this a great combo set for seniors. Wide toplines and soles make mishits still fly straight and somewhat far. To speak about some of the benefits of the design of these irons, let’s start with the Right Light Technology. This basically means they take some weight away from the shaft, grip, and clubhead to make the club lighter and allow you to swing faster and hit longer shots. Next, there is the exoskeleton weighting, which means most of the mass of the club is around the perimeter, resulting in increased forgiveness across the entire face. Along with the others, if you are patient, you can find a set for around $200. The one pictures below has steel shafts, but one sold for $202.50 with graphite shafts! TL/DR: These are Wilson’s most forgiving, longest, and lightest irons, so they are perfect for seniors who think their clubs now are too heavy for them. 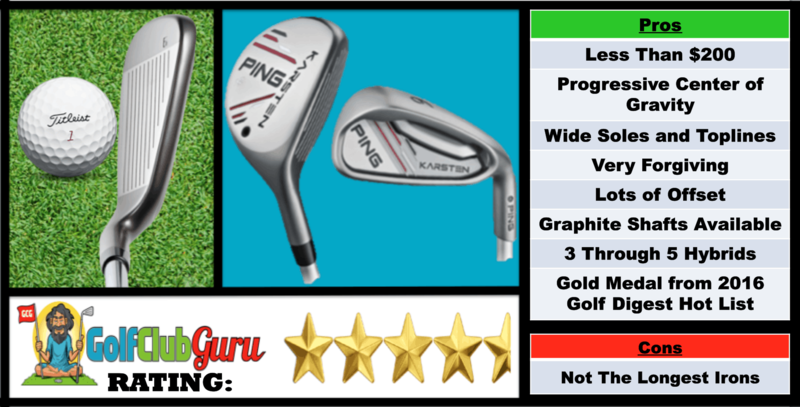 Ping Karsten irons are very similar to Ping K15 irons, which was my top pick in the Best on a Budget: Super Game Improvement Irons. Together, they are the two most forgiving clubs that Ping has ever made. The soles and toplines are very wide, which typically results in more forgiveness across the face. As you can see from the at address picture, there is a good bit of offset, really encouraging a good impact position and square face at impact. For the irons, the center of gravity is noticeable more back and lower. As a result, balls fly very high. For the hybrids, on Center of Gravity is actually progressive. This means that it is further back on the lower lofted hybrid (3) and closer to the face on the higher lofted hybrid (5) to reduce spin. Ping also touts a high Moment of Inertia Design, due to internal heel and toe weights, resulting in increased forgiveness in the hybrids. As 2014 was only a few years ago, the Ping Karsten irons still sell for a good bit, but you can pick them up for $200 if you are patient. By the way, a seller on eBay you should look for is 3ballsgolf. I’ve bought a lot of stuff from them and they provide incredible service and quality clubs for incredible prices. TL/DR: The Ping Karsten Irons, or the Ping K15 irons, are perfect for seniors looking for extremely forgiving and oversized clubs. When you’re faced with a pile of wrinkled clothes, curtains, or other fabrics, a good ironing board—and iron—makes life much easier. naturally like your web site however you have to check the spelling on quite a few of your posts. A number of them are rife with spelling issues and I in finding it very bothersome to inform the truth on the other hand I’ll surely come back again. Some really nice and utilitarian info on this internet site, as well I think the layout has got superb features. I’m impressed, I must say. Really not often do I encounter a blog that’s both educative and entertaining, and let me inform you, you could have hit the nail on the head. Your thought is excellent; the issue is one thing that not sufficient individuals are talking intelligently about. I’m very joyful that I stumbled across this in my search for something referring to this. Absolutely written content, thank you for information. “In the fight between you and the world, back the world.” by Frank Zappa. Hey there, I think your site might be having browser compatibility issues. When I look at your website in Ie, it looks fine but when opening in Internet Explorer, it has some overlapping. I just wanted to give you a quick heads up! Other then that, wonderful blog! We’re a bunch of volunteers and opening a new scheme in our community. Your site offered us with valuable information to paintings on. You have done a formidable activity and our entire group will be thankful to you. I genuinely enjoy looking through on this internet site, it contains superb articles. “Do what you fear, and the death of fear is certain.” by Anthony Robbins. I like this weblog very much, Its a real nice billet to read and obtain info . “Never contend with a man who has nothing to lose.” by Baltasar Gracian. I am really enjoying the theme/design of your weblog. Do you ever run into any internet browser compatibility issues? A couple of my blog readers have complained about my site not working correctly in Explorer but looks great in Safari. Do you have any ideas to help fix this issue? Great write-up, I am normal visitor of one¦s website, maintain up the nice operate, and It is going to be a regular visitor for a lengthy time. Usually I don’t read article on blogs, but I would like to say that this write-up very forced me to try and do it! Your writing style has been amazed me. Thanks, very nice post. I¦ve been exploring for a bit for any high quality articles or blog posts in this kind of house . Exploring in Yahoo I finally stumbled upon this website. Reading this info So i¦m satisfied to show that I have an incredibly good uncanny feeling I found out exactly what I needed. I such a lot indisputably will make sure to don¦t disregard this web site and provides it a glance on a relentless basis. I like this web site very much, Its a really nice place to read and get information. I believe this web site has some really wonderful information for everyone. “Je veux que les paysans mettent la poule au pot tous les dimanches.” by King Henry IV of France. Hey very nice site!! Guy .. Beautiful .. Superb .. I’ll bookmark your website and take the feeds also…I’m happy to find a lot of useful information here within the publish, we want work out extra techniques on this regard, thanks for sharing. . . . . .
What i don’t understood is actually how you’re not really much more well-liked than you might be now. You’re so intelligent. You realize therefore considerably relating to this subject, made me personally consider it from so many varied angles. Its like women and men aren’t fascinated unless it’s one thing to do with Lady gaga! Your own stuffs outstanding. Always maintain it up! It?¦s really a nice and helpful piece of info. I?¦m satisfied that you simply shared this helpful information with us. Please stay us up to date like this. Thank you for sharing. I?¦ll right away seize your rss as I can not in finding your email subscription link or newsletter service. Do you have any? Please allow me know so that I could subscribe. Thanks. My spouse and i got really peaceful that Louis could deal with his research by way of the precious recommendations he obtained through the weblog. It’s not at all simplistic to just happen to be offering tips that the rest could have been trying to sell. And we do know we have you to give thanks to for this. These explanations you have made, the straightforward website menu, the relationships you assist to promote – it’s got all extraordinary, and it is leading our son and our family consider that that situation is brilliant, and that is really important. Many thanks for everything! Appreciate it for helping out, good info. “In case of dissension, never dare to judge till you’ve heard the other side.” by Euripides. Just desire to say your article is as astounding. The clearness in your post is simply excellent and i could assume you’re an expert on this subject. Well with your permission allow me to grab your feed to keep up to date with forthcoming post. Thanks a million and please keep up the enjoyable work. Thanks for another wonderful post. The place else could anyone get that kind of info in such a perfect method of writing? I’ve a presentation subsequent week, and I’m on the search for such info. I really like reading through and I believe this website got some genuinely useful stuff on it! . Heya i’m for the primary time here. I came across this board and I to find It really helpful & it helped me out much. I am hoping to offer one thing back and help others such as you aided me. Thank you, I have recently been looking for information approximately this topic for a long time and yours is the greatest I have discovered so far. However, what concerning the conclusion? Are you positive concerning the supply? I blog often and I genuinely thank you for your content. The article has truly peaked my interest. I will book mark your website and keep checking for new information about once per week. I subscribed to your Feed too. I don’t even understand how I ended up right here, but I thought this publish was great. I don’t recognise who you’re however certainly you’re going to a well-known blogger in the event you are not already 😉 Cheers! I’m impressed, I have to say. Actually not often do I encounter a blog that’s both educative and entertaining, and let me inform you, you will have hit the nail on the head. Your concept is outstanding; the problem is something that not enough people are speaking intelligently about. I am very blissful that I stumbled across this in my search for one thing referring to this. I’m really impressed with your writing abilities as well as with the layout on your blog. Is that this a paid topic or did you customize it yourself? Anyway keep up the nice quality writing, it’s rare to look a great weblog like this one today..
My brother suggested I would possibly like this blog. He was totally right. This submit truly made my day. You cann’t believe simply how much time I had spent for this info! Thank you! Hello there! This post couldn’t be written any better! Reading this post reminds me of my previous room mate! He always kept talking about this. I will forward this article to him. Pretty sure he will have a good read. Thanks for sharing! Thanks so much for giving everyone an exceptionally nice possiblity to read critical reviews from here. It is usually so pleasing and also full of a great time for me personally and my office acquaintances to visit the blog particularly three times weekly to read the fresh stuff you have. And definitely, I’m just always contented for the dazzling opinions served by you. Selected two areas in this post are really the most effective we’ve had. The very core of your writing whilst appearing agreeable initially, did not work perfectly with me personally after some time. Somewhere throughout the sentences you managed to make me a believer but only for a very short while. I however have a problem with your leaps in assumptions and you would do nicely to fill in all those breaks. In the event that you can accomplish that, I would certainly be impressed. I love what you guys tend to be up too. This type of clever work and exposure! Keep up the superb works guys I’ve included you guys to my personal blogroll. I?¦ve learn a few just right stuff here. Definitely value bookmarking for revisiting. I surprise how so much attempt you put to make such a magnificent informative website. I simply desired to appreciate you once again. I do not know the things that I would have handled without these creative concepts documented by you concerning that topic. It absolutely was a frightful concern in my position, but spending time with this well-written approach you handled that made me to cry over joy. I’m just happier for your service and thus hope that you realize what a great job you were providing instructing other individuals thru your website. Probably you have never encountered all of us. I’m still learning from you, but I’m improving myself. I absolutely love reading everything that is written on your site.Keep the information coming. I liked it! But wanna remark on few general things, The website style is perfect, the subject matter is rattling fantastic. “Earn but don’t burn.” by B. J. Gupta. hey there and thank you for your info ? I?ve certainly picked up something new from right here. I did however expertise several technical points using this web site, since I experienced to reload the site lots of times previous to I could get it to load properly. I had been wondering if your web host is OK? Not that I am complaining, but slow loading instances times will sometimes affect your placement in google and could damage your high quality score if advertising and marketing with Adwords. Anyway I?m adding this RSS to my e-mail and could look out for much more of your respective intriguing content. Make sure you update this again very soon.. I have been exploring for a bit for any high quality articles or weblog posts in this sort of area . Exploring in Yahoo I ultimately stumbled upon this website. Reading this info So i’m satisfied to express that I have a very just right uncanny feeling I discovered exactly what I needed. I most definitely will make sure to do not put out of your mind this web site and provides it a glance on a continuing basis. I like the valuable info you supply in your articles. I will bookmark your weblog and check once more here regularly. I am moderately certain I will be told a lot of new stuff right here! Good luck for the next! Great – I should certainly pronounce, impressed with your website. I had no trouble navigating through all the tabs and related info ended up being truly simple to do to access. I recently found what I hoped for before you know it in the least. Reasonably unusual. Is likely to appreciate it for those who add forums or anything, website theme . a tones way for your client to communicate. Excellent task..
That is the right blog for anyone who wants to seek out out about this topic. You understand a lot its virtually laborious to argue with you (not that I truly would need…HaHa). You undoubtedly put a brand new spin on a subject thats been written about for years. Nice stuff, just great! Hi there, I found your site by means of Google whilst searching for a similar topic, your site came up, it seems to be great. I have bookmarked it in my google bookmarks. hello!,I really like your writing so a lot! share we be in contact extra about your post on AOL? I require a specialist on this house to unravel my problem. Maybe that is you! Taking a look forward to see you. You really make it appear so easy together with your presentation however I find this topic to be really one thing that I feel I would never understand. It sort of feels too complicated and extremely vast for me. I am looking forward for your next put up, I will attempt to get the dangle of it! Thanks for any other informative website. Where else may I get that type of info written in such a perfect method? I have a mission that I’m just now operating on, and I’ve been at the glance out for such info. Thank you for another informative website. The place else could I am getting that type of information written in such an ideal approach? I have a undertaking that I’m simply now running on, and I have been at the glance out for such info. Excellent weblog here! Additionally your website so much up very fast! You can certainly see your skills in the paintings you write. The world hopes for even more passionate writers such as you who aren’t afraid to mention how they believe. At all times follow your heart. I genuinely enjoy looking through on this site, it has got fantastic posts. “Something unpredictable but in the end it’s right, I hope you have the time of your life.” by Greenday. Hi there, I discovered your web site by means of Google at the same time as looking for a similar topic, your web site came up, it seems to be good. I have bookmarked it in my google bookmarks. I carry on listening to the rumor talk about getting boundless online grant applications so I have been looking around for the finest site to get one. Could you advise me please, where could i find some? What’s Going down i’m new to this, I stumbled upon this I have found It absolutely helpful and it has helped me out loads. I hope to give a contribution & assist different users like its aided me. Great job. I’d have to verify with you here. Which is not one thing I normally do! I take pleasure in studying a submit that may make folks think. Also, thanks for permitting me to remark! Thanks for sharing superb informations. Your website is very cool. I’m impressed by the details that you have on this website. It reveals how nicely you understand this subject. Bookmarked this website page, will come back for more articles. You, my friend, ROCK! I found just the information I already searched everywhere and simply couldn’t come across. What an ideal website. I went over this site and I believe you have a lot of great info , bookmarked (:. I have been checking out some of your articles and i can claim pretty good stuff. I will definitely bookmark your website. Good day very cool website!! Man .. Excellent .. Superb .. I will bookmark your site and take the feeds also…I am satisfied to search out a lot of useful information here within the submit, we need work out extra techniques in this regard, thanks for sharing. . . . . . I not to mention my pals ended up going through the nice suggestions located on your website and so suddenly developed a terrible feeling I had not thanked the web site owner for those secrets. My ladies are actually absolutely glad to see all of them and have really been having fun with those things. Appreciation for genuinely quite thoughtful and then for choosing some notable areas most people are really eager to learn about. Our own honest regret for not saying thanks to you sooner. I really enjoy examining on this web site, it holds excellent articles. “Beware lest in your anxiety to avoid war you obtain a master.” by Demosthenes. Hi! I’ve been following your blog for a while now and finally got the bravery to go ahead and give you a shout out from Dallas Tx! Just wanted to tell you keep up the good work! It’s actually a great and helpful piece of information. I’m satisfied that you just shared this useful info with us. Please stay us up to date like this. Thanks for sharing. me when new comments are added- checkbox and from now on whenever a comment is added I receive four emails with the exact same comment. Just want to say your article is as amazing. The clarity to your submit is simply nice and i can suppose you’re knowledgeable in this subject. Fine together with your permission allow me to seize your RSS feed to stay updated with imminent post. Thank you 1,000,000 and please keep up the gratifying work. Woah! I’m really loving the template/theme of this blog. It’s simple, yet effective. A lot of times it’s very hard to get that “perfect balance” between user friendliness and visual appearance. I must say that you’ve done a amazing job with this. In addition, the blog loads very fast for me on Firefox. Outstanding Blog! I was just searching for this info for a while. After 6 hours of continuous Googleing, at last I got it in your website. I wonder what’s the lack of Google strategy that do not rank this kind of informative sites in top of the list. Normally the top sites are full of garbage. Outstanding post, I conceive blog owners should learn a lot from this web blog its very user pleasant. What i do not understood is actually how you are not actually much more well-liked than you might be right now. You’re so intelligent. You realize thus significantly relating to this subject, produced me personally consider it from a lot of varied angles. Its like men and women aren’t fascinated unless it is one thing to do with Lady gaga! Your own stuffs excellent. Always maintain it up! Hello would you mind sharing which blog platform you’re using? I’m going to start my own blog soon but I’m having a hard time selecting between BlogEngine/Wordpress/B2evolution and Drupal. The reason I ask is because your design seems different then most blogs and I’m looking for something completely unique. P.S My apologies for being off-topic but I had to ask!